The Best Grilled Cheese EVER! Did everyone have a good week? I hope so! I was in the car most of Thursday and Friday and our show in Boone went well. I guess kids up there don’t know what real rock and roll music is because they complained we were too loud. Seriously? Anywho… THIS RECIPE… you guys will absolutely die! 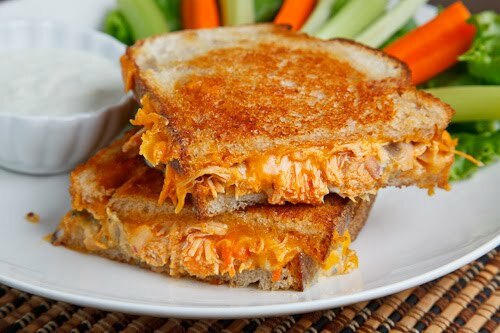 Grilled cheese sandwiches have always been a really easy treat to make, but a BUFFALO CHICKEN GRILLED CHEESE?!?! I might just die! You won’t need too much for this recipe and you can always substitute certain things. By the way, I kind of have an obsession with buffalo sauce, so that probably explains a lot. Directions: Mix the chicken, hot sauce, mayo, carrot, celery and onion in a small bowl. Butter grill side of bread. Put the chicken mixture on the bread, top with cheeses and cook until sandwich is golden brown and cheese is melted. And there ya have it. This sandwich is like a party in your mouth… and who doesn’t love to party? I’ve found that using rotisserie chicken is pretty easy. It’s much easier than boiling chicken, waiting for it to cool and shredding it. Enjoy your weekend and if you live here in Atlanta, get outside. It’s beautiful out today! Irene can’t touch this!